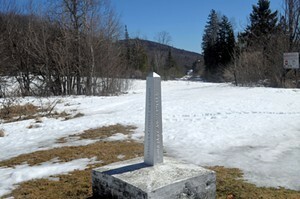 A small obelisk marks the U.S.-Canadian border in northern Vermont. Updated at 7:29 a.m. on January 15, 2016 with new information from court documents. U.S. Border Patrol agents caught a Québec man wearing white camouflage clothing and dragging a sled with $1.6 million worth of Xanax across the snowy border on Wednesday, authorities said. Around 1 a.m., an electronic sensor deployed by the U.S. Border Patrol to detect movement along the international line activated, according to an affidavit. Three Border Patrol agents from the Swanton sector, Eric Dauphinee, Donald Carmody and Clifton Allen, responded to the area near the sensor in North Troy. They encountered Cedrick Bourgault-Morin, 21, walking on railroad tracks that cross the border. International drug smugglers have previously used the railroad tracks, authorities said. Bourgault-Morin tried to bury the sled in snow as agents approached. The agents found a large duffel bag on the sled containing 300 vacuum sealed bags filled with 182 pounds of Xanax, prescription anti-anxiety medication, authorities said. They arrested Bourgault-Morin, who does not speak English. Prosecutors said in court documents that Bourgault-Morin is part of a "drug trafficking organization with substantial assets," and had help on both sides of the border. If convicted, Bourgault-Morin faces a five-year maximum prison sentence. "This is a great example of some of the training and unique skills our agents use to perform their border-security mission," U.S. Border Patrol Agent-in-Charge Fernando Beltran said. "I commend these agents for their continued vigilance in tracking criminals, and for seizing harmful drugs before they get into our communities." As Seven Days documented in May, Border Patrol agents who work Vermont's 78-mile international border arrest several hundred illegal immigrants and confiscate millions of dollars of drugs every year. The Swanton sector, responsible for the eastern New York, Vermont and New Hampshire, has 313 agents guarding the 295-mile stretch of the border, known to agents as the "slash."